Winncare Group leads the way in France in promoting solutions for improving the care of people with loss of autonomy and susceptible to pressure ulcer risk. The group has two production facilities in France associated with a strong commercial presence. In addition, the group operates with manufacturing and commercial business units in Poland, Germany, Spain, Tunisia, the United Kingdom and throughout Scandinavia. ASKLE SANTE specialises in the manufacture of supports aids for the treatment and prevention of bed sores and Posture Techniques Device Aids (DATP) for the elderly and/or handicapped and/or patients. The manufacturing unit is located in the south of France in Nîmes (30). MEDICATLANTIC specialises in the manufacture of medical beds and furniture for the elderly and/or handicapped and/or patients. The manufacturing unit is located in the north of the Vendée (85) in Saint-Paul-Mont-Penit. WINNCARE SPAIN specialises in the manufacture of patient hoists and bed and chair maintenance products for the elderly and/or handicapped and/or patients. The manufacturing unit is located in the south-east of Spain in Valencia. 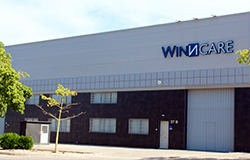 Created in January 2011, WINNCARE TUNISIA is a company specialized in manufacturing accessories for medical devices (cover for cushions and mattresses for the prevention and treatment of pressure ulcers, slings for hoists) and other textile products. Winncare Tunisia is a subsidiary of the Winncare Group, located in Mahadia area, boulevard de l'Environnement, 5180 Ksour-Essef. Created in January 2011, WINNCARE SERVICES is a department specialized in helping providers who wish to improve their technical expertise in products and services. Winncare services helps with quality management and incorporates a certified group which medical device distributors can join. The aim of Winncare Services is to train, advise and assess through audit and quality control, helping in preventative and curative maintenance, upkeep, servicing and disinfection of medical devices. For further information, please visit our website under the heading Winncare Services. The aim of these subsidiaries of the WINNCARE group is to design, manufacture and sell medical devices that satisfy our customers' requirements, for Home Help and for establishments (Health and medical-social establishments).